Germany takes the lead. Singapore becomes second. MONTREAL, Jan. 13, 2017 /PRNewswire-HISPANIC PR WIRE/ – Passport Index, the real-time global ranking of the world’s passports has announced a new update to its celebrated web service. Germany takes the lead with a visa-free score of 157. Singapore overtakes South Korea and becomes the highest ranked Asian passport, with a visa free score of 156, coming second. South Korea fell to 6th place (152), while Japan, rose to 4th place, tied with European countries like Italy, Netherlands, Belgium, and others whose visa-free score is 154. Visa-free score represents the number of countries a passport holder can visit visa-free or with visa on arrival. 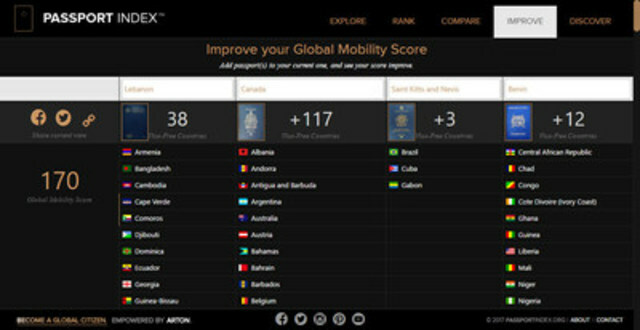 In addition to the popular mosaic of passports, visitors of PassportIndex.org can now see the overall changes to the ranking of countries in 2016. Marshall Islands is on top of the winners’ list by adding 35 countries to its visa-free score. Palau, Micronesia, follow with 34 additional countries, while Solomon Islands and Tuvalu added 33. Peru is the biggest winner in South America with additional 31 countries. The newly added World Openness Score (WOS) tracks the progression of freedom of mobility across the globe. The world openness score in 2016 was 17,925. In the few days of 2017, the score has already increased to 17,948. This trend shows opening of borders but will it continue? With the recent backlash on globalisation, the World Openness Score may be in danger of decline. Comparing passports has never been easier with the streamlined comparison tables and powerful filters which allow you to focus on the countries you need. The newly added Improve function on the other hand allows you to quickly see the potential of combining two passports together. Fans can add one or more passports to their current travel document with the goal to improve their Global Mobility Score (GMS). For example, a Lebanese citizen has a GMS of 38. However, by adding a passport of Saint Lucia, their Global Mobility Score increases drastically to 123, which would represent the possibility of visa-free travel to over 61% of the countries we examine. For many people, this is priceless. In recent years, citizenship by investment has become a US$2B industry, with over 20,000 investors seeking a second residency or citizenship around the globe very year.